Minnie Brenner, 92 years old was a matriarch in her own way and throughout her life: Raised six girls, a devout catholic, gave unselfishly of her time to many non-profit organizations, an aspired business owner and a beacon in the Davis community has passed July 25, 2018. Minnie joins her hubby Harry upon his death March 31, 2015. The two would have celebrated 70 years of marital bliss on July 25th. Born in Strasburg, North Dakota to Roy and Elizabeth Schreiner the family headed west during the depression to California in 1937 and settled in the Sutter Basin to become one of several farmers in Robbins, California. Minnie is the last surviving Schreiner of a family of two brothers and three sisters. Minnie and Harry lived on “J” Street in Davis after marriage in 1948 renting a duplex then purchasing their first home three years later. As the family grew so did the house, which Harry built, adding a second story and family room – by himself. Raising six daughters they always were committed to family vacations – long journeys to Kansas, numerous tent camping expeditions, summers at Stinson Beach, annual Mother’s Day at Fort Bragg, and numerous family and friend celebrations with good food and good wine. Minnie’s energy and charismatic personality can best be summarized by what she did. 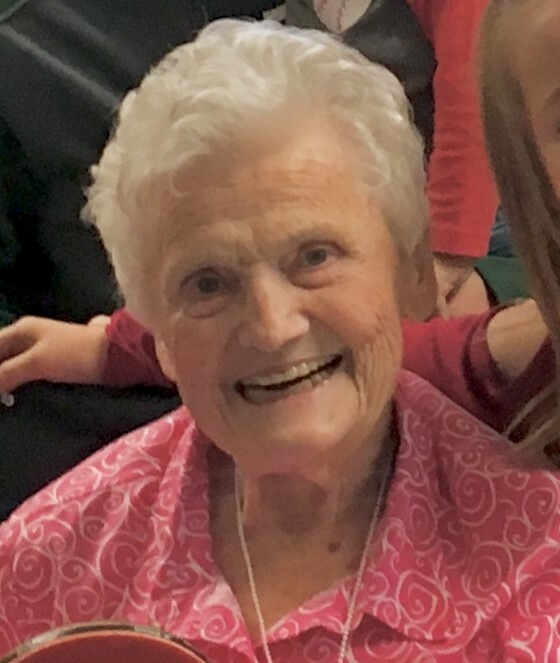 She was extremely generous of her time, volunteering as a member of Sutter-Davis Hospital Auxiliary since 1967, the American Heart Association for 20 years, and active in the Women’s Business Soroptimist for 26 years as proprietor of the Davis Welcome Service. Minnie and Harry were among those that championed to plan, fundraise and build St. James Church to what it is today along with the adjoining Rectory and Elementary School. Sharing and giving was their mantra, having hosted several international students from abroad and keeping those relationships until this day. Community block gatherings were common so was their hospitality as new neighbors arrived on “J” Street and beyond. A self-taught seamstress, she adorned her girls with new dresses for holiday occasions, often looking alike to capture the family photo. A tradition in the household was to have our bangs cut every Saturday while enjoying the Ed Sullivan Show and the champagne musical man Lawrence Welk. Minnie’s creativity for crafts were a common occurrence. Making holiday ornaments, pine cone trees, decoupages, quilts, embroidery, holiday wreaths, and so much more was her favorite pastime. An extraordinary cook, healthy, fresh meals were served promptly at 6pm. Those that couldn’t make the dinner table at that time she made sure there were leftovers on the stove. Desserts were her fancy – pies, mayonnaise cake, sherry cake, oatmeal cookies and of course her infamous butter cookies were her namesake. She always made our birthday cakes and Harry would make homemade ice cream. A card shark in bridge, she had several ladies over to play monthly and even got Harry to play as their friends had frequent gatherings on “J”. Minnie’s home gardens were her passion and nurturing that infamous rose garden full of over 30 varieties kept her content well into her 80’s. Minnie will always be remembered for her contagious smile and having conversations with anyone she encountered. This kept her mind and body going. But her soul and spirit were her family. Six daughters: Joanne Chiofolo (Jonathan), Marianne Brenner (Glenn), Julianne Brenner (Dale), Rosanne Kenoyer (Bobby), Elizabeth Brenner (Peggy) and Lorianne Brenner. Five Grandchildren Stephanie Chiofolo (deceased 1988), Mathew Chiofolo (Hillarie), Jason Kenoyer (Mary), Jordan Kenoyer and Molly Finnerty. Her loving “greats” Ava and Scarlett Chiofolo; Jacob, Lily and Hank Kenoyer, Amelia and Maxwell Thomas and numerous grand dogs. To one FABULOUS woman who we are all blessed to have known as a mother, mentor, grandmother, great-grandmother and friend. The Brenner girls truly appreciate ALL the staff at Carlton Senior Living in Davis and Yolo Hospice staff that cared for our Mother. We are eternally grateful. A vigil will be held at Smith Funeral Home, 116 D Street, on Thursday, August 16, 7:00p.m. The funeral mass will be at St. James Catholic Church, 1275 B Street at 11 a.m. Friday, August 17. A reception will immediately follow at St. James Parish Hall. Graveside service will be private.